There are times when nothing but cutting single layer will do. Yes, we all hate it but we do what we have to to Make It Work! Sometimes it is necessary when we are short on fabric or need to match a print, stripe or plaid. I believe it is the sign of a quality garment when care and thought has so obviously been put into the layout of the pattern. The little bit of extra work will bring you so much pleasure every time you wear the garment. Plus, it prevents those embarassing giant flowers on the bust apex! 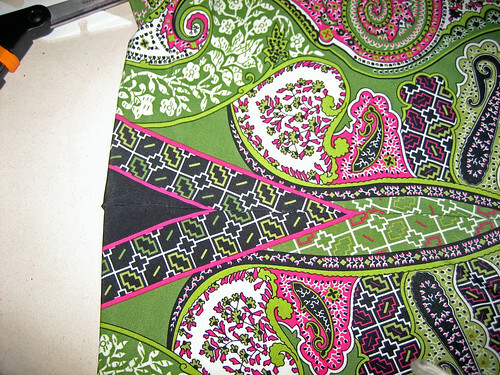 I am currently working on a dress using a bold print from Gorgeous Fabrics. The print reminds me of those scarf panels that were everywhere a few years back: large square motifs surrounded by a border. For the last few days I have been trying to work out the cutting in my head. The center motif is large so I allowed about 1.5 yards of extra fabric to give me plenty to play around with. Now this is where a dressform and camera really come in handy! 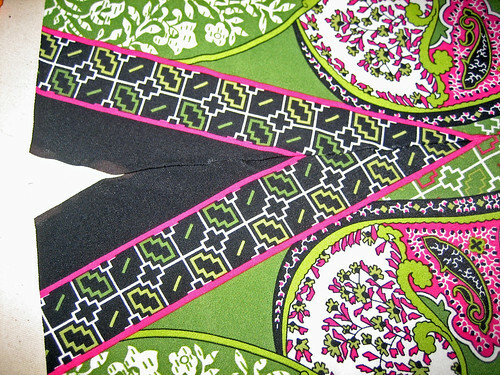 I started with the largest section – the skirt – which took up an entire motif. Then I cut the rest of the front, pinning each section onto my dressform. I find that taking a picture really gives me the best feel for how pleasing and flattering my pattern arrangement is. 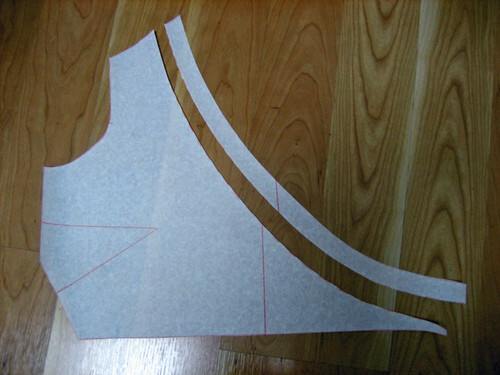 Once I have the front worked out, the back is easy as are the sleeves which will each be cut from the center of the motif – the white area. Because the skirt was a little wider than the square motif I wanted to make sure I matched the border at the hemline front and back. Here I’ve pinned the hem edges together to make sure I have a match. The white triangle you see at the bottom is the white selvage. Once I pin up the hem you won’t see the white part at all. In order to make a match at the hemline I had to cut the skirt back with a seam. Because the outer edge beyond the border was different on each side I also had to cut the skirt upside down. In the photos above, the outer edge is black – on the other side it is the green print. I still haven’t decided how I will finish the neckline. I have some of the coordinating beaujolais rayon/lycra that I could bind the neck with and introduce as piping in other areas or I could use the border cut on the cross grain – I’ll work that out as I go. Stay tuned. 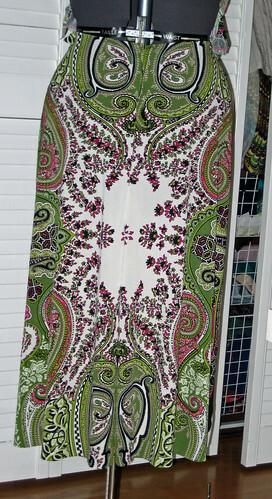 Patterns were sold via local newspapers well into the 70’s and this is an example. This reminds me of Simplicity’s recent 60’s reissue, but I think this Parade style is more flattering and most women could wear this. I love the neckline. A simple but attractive wrap dress. I like the two button closure and the one off-side pocket. 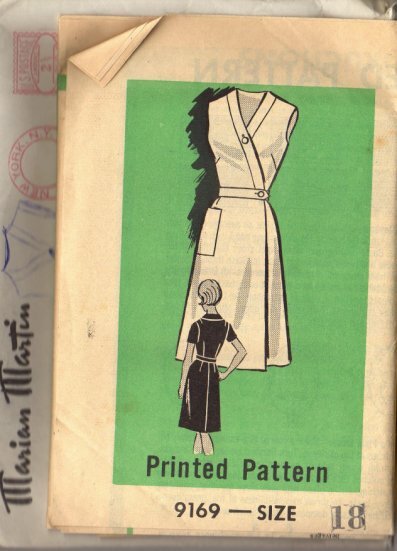 I think Marian Martin patterns were also sold through newspapers. Marian Martin 9166 – Late 60’s or early 70’s ? I’m having a hard time dating this style; it may well be the same year as the above Marian Martin given the pattern numbers are so close. I’m kind of on the fence right now about this and I’m not sure I’ll keep it. 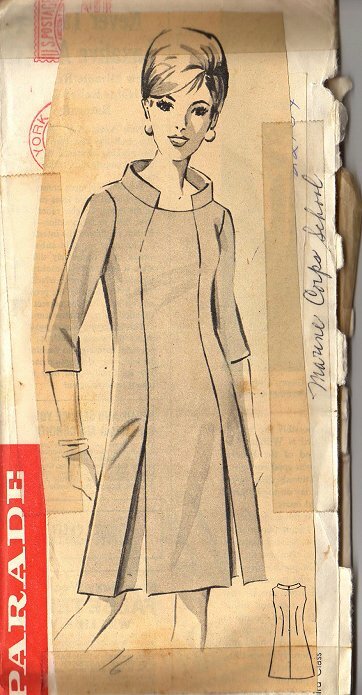 I like the collar and big buttons down the front, but the seaming on the skirt – not so sure. Might be okay in a dark fabric though. 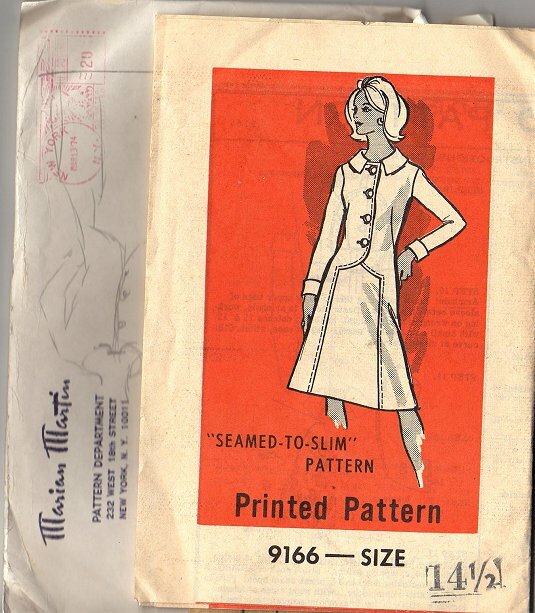 One cool thing: this is a “half size”, the old way that patterns were sized for petites. By the late 80’s this sizing standard had been dropped entirely by pattern companies. Its a Halston – what more can I say? This has all of the refined details of his sportswear; body skimming but still fitted at the shoulder, waist and hips, a very narrow waistband and a flat front on the pants. I should really scan the instructions and show you the technical drawing because the back of the shirt jacket has a lot of interest. It has a back yoke and jean jacket with princess seams from the armsyce to the hem. Lots of topstitching on the jacket and the pants. Recommended fabrics: wool, synthetic double knit (so 70’s), linen, garbardine, cotton broadcloth and (naturally) – Ultrasuede! On my latest wrap dress I wanted to do something different with the sleeve that was interesting but not too fussy. As I was trying to go to sleep one night, it hit me: taking the scarf sleeve and turning it around into a split sleeve! Still covered, still cool, just a little different. 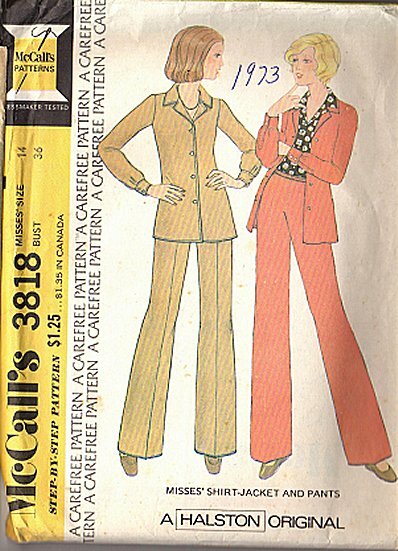 The pattern alterations are easy! 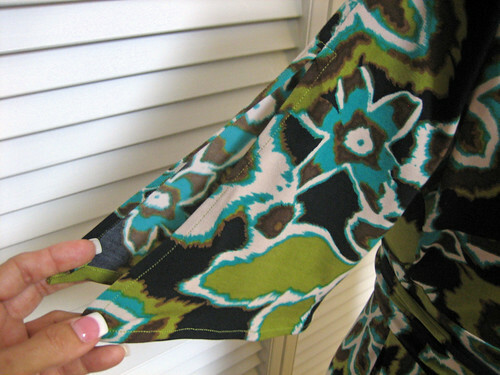 You are basically splitting the sleeve straight down the shoulder line to the hem, removing the flare from the underarm and adding it to the new seam. 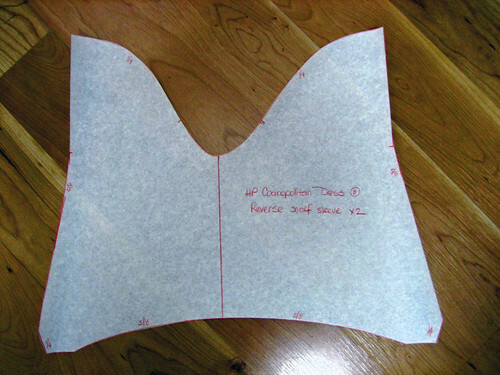 I also thought it would be nice to eliminate the unnecessary underarm seam so I simply lapped the front and back at the seamline (since this sleeve will have a lot of movement I didn’t want a serged seam showing under the arm). Don’t forget to add a seam allowance to the new seam. The only drawback is that this sleeve cannot be set in flat, it must be set in the round. 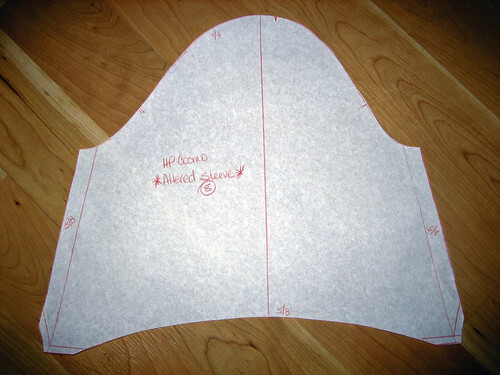 To sew this, simply stitch from the shoulder point down as far as desired – purely personal preference, I sewed down about 3.5″ to the point where the sleeve starts to flare out. If you wanted it more open you could start the flare higher. 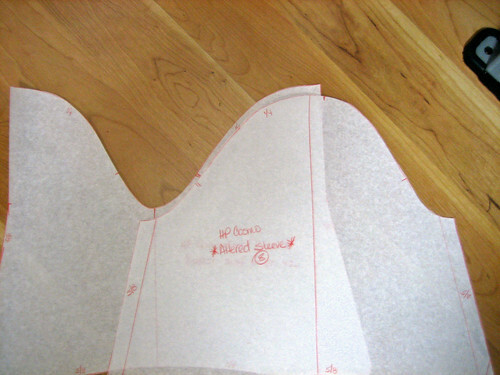 Once that is sewn finish and turn up the hems and you are ready to set the sleeve. To reinforce this area, I sewed through a small square of stay tape. You could also fuse a tiny bit of interfacing over the stitching line to give it a bit of strength. If you look closely at my pattern you will see that I have a 1/4″ seam allowance in the cap and 5/8″ everywhere else. Knit sleeves are just so much easier to set with a 1/4″ seam allowance especially if they are set in flat. 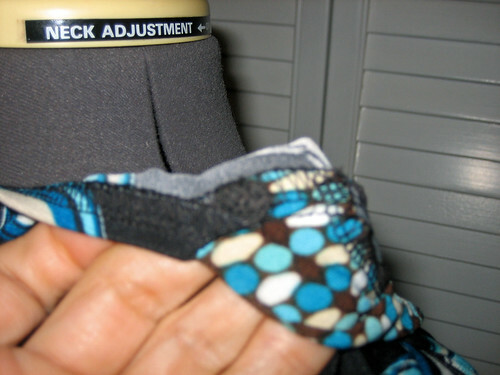 Remember that the armscye seam allowance will need to be reduced as well. 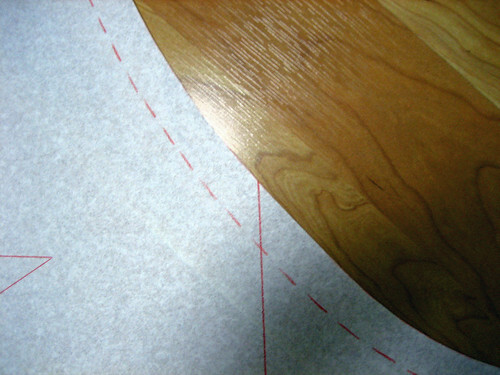 I am sometimes asked why I bother to leave the 5/8″ seam allowance at the side seams instead of trimming them down to 1/4″ to make serging easier. Well, I am not a big fan of serged side seams on knit dresses (or long skirts and pants) as they tend to draw up. 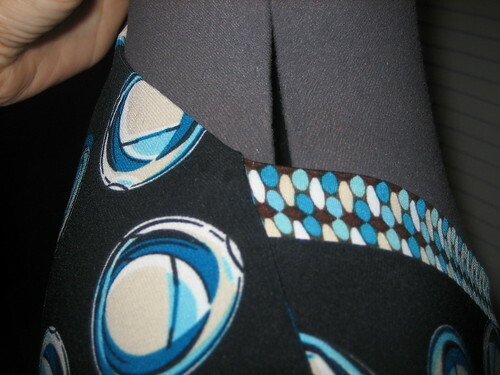 Instead, I sew the standard seam with a tiny zigzag – stretching the seam a little as I sew – and press it open. 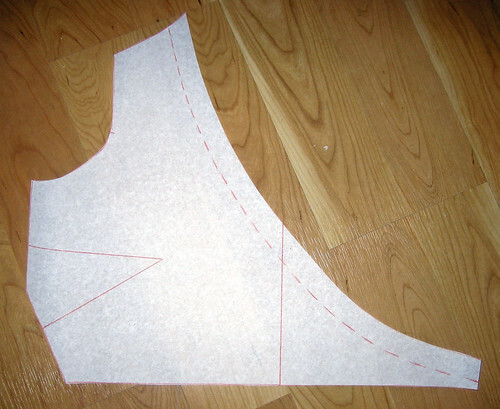 This gives a nice flat seam. The unfinished edges are perfectly acceptable to me. It is more important to me to retain the fluidity of the knit than to have a serged finish. To see the completed dress along with the accessories I chose to wear with it and get the fabric information, please visit my personal blog, Behind The Seams. As promised, here is a quickie tutorial for adding a band to the neckline of a surplice top as I did on my Cosmopolitan Dress. I love this type of finish because it is so easy and neat. 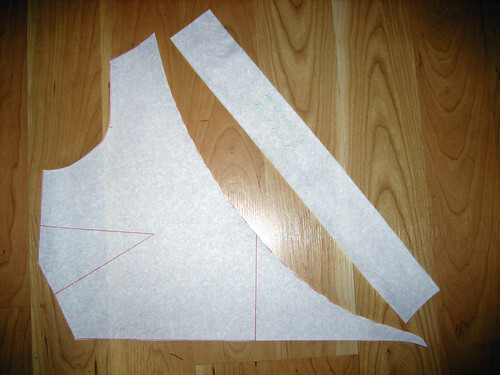 STEP 2: Measure the length of the neckline *on the seamline*. Yes, the photo shows me measuring at the cut edge – I was trying to pose with the left hand while the right was operating the camera! 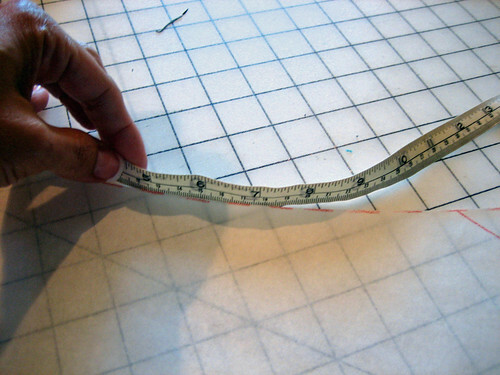 The length of the actual band will depend on a) the stretchiness of your fabric and b) your bust size. I initially cut my band 2″ shorter than the neckline but that turned out to be too long so I cut another inch off. 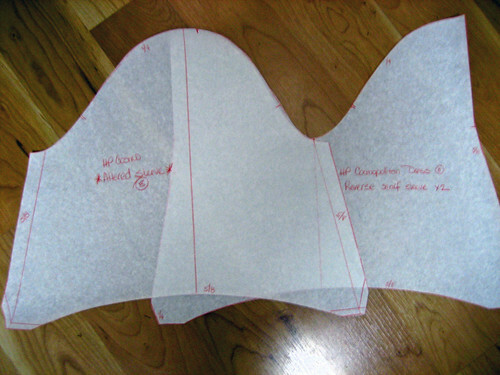 STEP 3: Draft band pattern: cut pattern twice the finished width (two x 1″=2″) plus *two* seam allowances ( two x 1/4″=1/2″) by the length determined in STEP 2. The bands should be cut with the greatest amount of stretch along the long edges. Sewing is easy: fold the band wrong sides together, lengthwise. Stretch to fit neckline, serge. If you are unsure about the length of your band you should check the fit by basting it in first. I’ve done this so much that I can judge it by feel alone. If you are worried about everything being perfect even you can quarter-mark the neckline and the band. I don’t feel it’s really necessary to do that because the distance is short. Once you’ve done your permanent stitching press the seam allowances towards the garment. I elected not to run the band around the back neckline because a) it’s easier and b) I have long hair and no one will ever see it anyway. I serged elastic into the back neckline. To finish everything neatly sew your shoulder seams (which I cut down to 1/4″) making sure the back neckline goes 1/4″ past the finished band. Turn the back neckline snugly over the band and serge. If you are having trouble visualizing this and own Jalie 2449 it is the same finishing method. Hopefully the photos are pretty clear. So, here is the completed HP Cosmopolitan dress! I am currently looking for a job and this dress will work nicely in a professional environment. South Florida is very casual – even my best friend who is a senior partner in a law firm only wears suits for court. 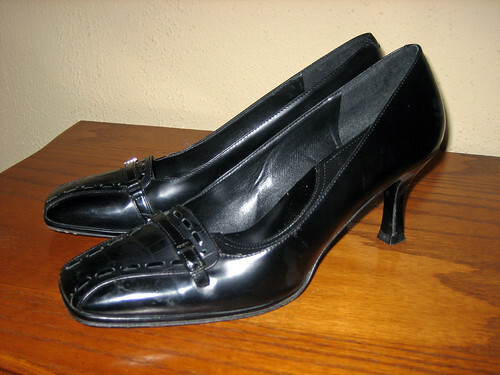 I plan on wearing it with these very comfortable, conservative Via Spiga pumps but to rock it out a little I added a beautiful mabe pearl necklace on a black leather choker. All-out conservative is just not me! 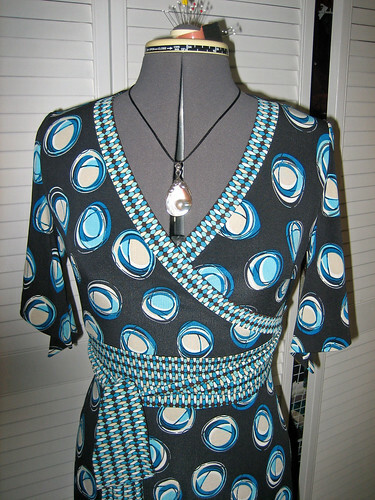 This weekend I will be posting a quickie tutorial on how to finish the neckline with bands – so easy! so fast! You can see how easily this dress could also go out to dinner after work with a simple change of shoes! For more information about the fabrics I used, please visit my Behind The Seams blog.